In Port Kells (now a neighbourhood in Surrey, British Columbia), there is a house on the corner of 96 Ave. and 192 St. that is truly steeped in history. It was turned into a pub in 2005, and whoever stops here for a beer should take a look at the pictures on the walls. They show some of the history of the bar, which was originally the estate of a German baron. Karl Mackensen von Astfeld, also called Carl von Mackensen, was born in 1878 in Strasbourg, which was part of Germany at the time. Carl was the nephew of the prominent Prussian Field Marshall General August von Mackensen. However, in his military career Carl only reached the rank of Second Lieutenant in the Landwehr cavalry. He left the army in 1904 and set off for Canada. He settled in the community of Port Kells, where he gained a bit of wealth as a poultry farmer with his ‘Black, White and Red Poultry Farm’. In 1910, Carl bought a farmhouse and transformed it into a small “castle”, as his neighbours soon took to calling it. He even had a medieval tower built for his 16-room palace. The tower windows were decorated with his family crest, and old European paintings, swords, pistols, and muskets were hung on the walls. Carl was well-regarded in Port Kells because of his generosity. He invited the whole community over for presents on Christmas Eve, even providing everyone with food and drinks. However, Carl travelled a lot between North America and Germany from 1910 to 1914, which raised suspicion among the residents of Port Kells. It seemed strange to them that the nephew of a field marshall general would raise poultry, give presents to the whole town, and regularly travel to his old homeland via the USA. He was suspected of being a spy and of smuggling his compatriots into the USA in order to save them from being interned in Canada. In 1915, when Carl flew the Kaiser’s flag from his tower after the outbreak of the First World War, the Canadian authorities arrested and imprisoned him. 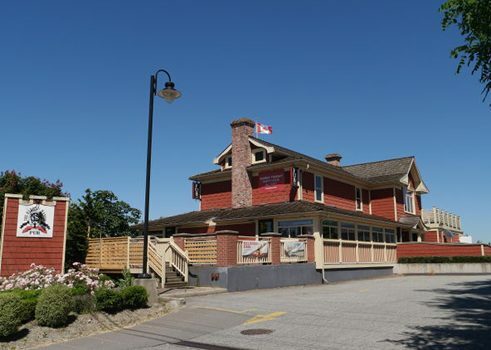 „Baron’s Manor Pub” | © Goethe-Institut Montreal All of his assets in Surrey were seized by the Office of the Custodian of Enemy Property, and from that point on, his house in Port Kells was considered a “spy house”. People came up with all sorts of wild stories: that there was a tunnel from his house to the Fraser river, that he used the tower as a radio transmitter, and that there were secret passages in the closets to hidden rooms. In 1918, after the end of the First World War, Carl von Mackensen was immediately deported to Germany without an explanation of the grounds. He tried several times to get his property back, but was unsuccessful. The baron, one of the Port Kells’ most colourful figures, finally died alone in Germany in 1967.